When deciding on your small chicken coop plans, as a general rule, make sure you have at least a 3 ft. x 3 ft. area for each bird. For example, if you build a coop that is 4 ft. x 3 ft. x 3 ft. (for a total of 36 square feet), you should have enough space to comfortably fit four birds. 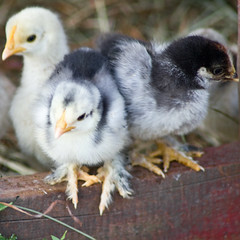 Smaller breeds, such as the bantams, may need less space, and larger breeds, such as Jersey Giants, will require more. If you are still not sure how much space you should allot for each bird, err on the side of caution by starting with fewer birds, or making a bigger structure than you think you will need. Remember too that your birds will need a place to stretch their legs. If you are unable to offer free range type conditions, make sure you have enough space for a proper run. As an alternative to using a small chicken coop with an attached run, you may also want to consider building a portable chicken tractor. I makes me really angry and frustrated that every link to “free” plans leads to this book you have to buy. This is just wrong. and I will do without before I buy the download. Be honest and take the link of all the free cites. You are not honest. Hi Irene, Are you referring to the link in my right sidebar for a free shed plan? That should take you to myshedplans.com, where they offer a free download for the blueprint of an 8×12 shed. I just checked the link to make sure the free blueprint was still available – it is. If you are referring to something else, please clarify and I can look into it.